Disabled people have been talked about a lot this week. First, it emerged that a Conservative party councillor and the minister for welfare reform discussed whether certain disabled people were “worth the full [sic: minimum] wage,” with Lord Freud bandying around £2 an hour as a ballpark. Next, there were rowdy exchanges in Wednesday’s Prime Minister’s Questions as Ed Miliband seemed to call for Freud's dismissal from government. #LordFreud, implausibly, has trended on Twitter for three days now. Arguments swirled on last night’s BBC Question Time as everybody condemned the minister’s language while attacking Labour’s Angela Eagle MP for using the issue as a “political football”. And yet, unfortunately, disabled people’s own voices have not been at the forefront of the public discussion. I do not know for certain the disability status of any of the people mentioned above. Anybody can become disabled at any time, and information about disability is neither as routinely collected nor as readily apparent as gender and ethnicity more often are. But it seems fair to say that disabled people are woefully underrepresented in public life, and perhaps particularly in national politics. As far as can be established, there are as few as four physically disabled MPs, and another five disabled people in the House of Lords. This is in a country were an estimated 19% of the adult population has a disability. Where conversations exclude the very people being talked about, the policies that emerge as a result can cause harm. Never mind £2 an hour, since 2011 more than 21,000 disabled people have been ordered to work for no payment at all, as part of the Department of Work and Pensions’ Mandatory Work Activity programme. The UN is beginning an unprecedented human rights inquiry into the UK’s treatment of the disabled. Disabled people have borne a significant weight of the coalition’s austerity programme, including the imminent removal of the Independent Living Fund (ILF), which recipients say allows them to be “pro-active, positive [people] who [are] part of the community”. This last point is of particular concern from the perspective of the RSA’s Connected Communities research programme, which examines the various benefits of people’s social connections. During the course of research in Hounslow this summer, to be published in a forthcoming report*, disabled people in the area told us about their challenges in maintaining socially active lives as they struggled with welfare sanctions, acute isolation, stress-inducing work capability assessments and complicated bureaucratic processes to access to the support they need. 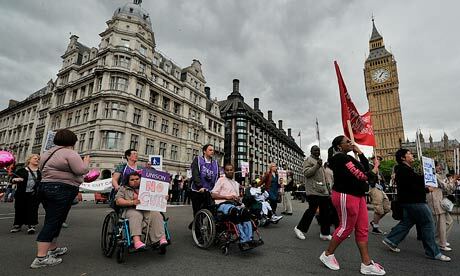 Government policies like the removal of the ILF risk making these difficulties more entrenched. The Coalition’s poor record on supporting disabled people is of great concern, but contrary to Miliband’s claim that “the nasty party is back”, this is not just a Conservative Party problem. Lord Freud’s involvement with the question of welfare reform dates back to 2006 when he started to advise the Labour administration on an issue he admitted he “knew nothing about”. The notorious tick-box Work Capability Assessments were rolled out under Labour in 2009. The noxious idea of a "dependency culture," that results in disabled people being targeted, bullied, and now subject to a national discussion about whether they are worthy of the minimum wage required for a person’s time, has been floating around Westminster for some time now. But disabled people are capable of advocating for a better settlement when they are engaged in public life. In South Africa, where disabled people formed an important bloc in the anti-apartheid movement, “Nothing about us without us” has become the slogan of disabled politicians who have secured greater levels of representation at parliament. While societal problems remain, South African disabled politicians have had an impact in reshaping various laws to reflect the needs and aspirations of disabled people, and their highly visible “enactment of ability in disability” on the national stage is said to have had a significant social impact. Back in the UK, Disabled People Against the Cuts (DPAC) have established themselves as among the most vocal, creative and forceful of the various post-recession social movements. They demonstrate the creative political potential of disabled people that many of our present political institutions are currently missing out on. Meanwhile, the Autism Employment Alliance, co-founded by RSA Fellow (and erstwhile RSA Director of Enterprise) Julian Thompson, is helping to improve the job prospects of autistic people, and showing that workers with disabilities are worth as much as anybody. Increased parliamentary representation for women and ethnic minorities has begun to be reflected in more positive legislation for people in those groups. Now, rather than discussing the “worth” of disabled workers, politicians need to find ways of involving disabled people in conversations that affect them, including by supporting more disabled people to take seats at parliament. And not just by lowering an MP’s salary to £2 an hour. *email matthew.parsfield@rsa.org.uk if you would like to see a copy of this report when it is published later this autumn. Excuse me, could I speak to the person in charge please? Thanks for your comment Stockpicker. In an ideal world I would agree with you that there wouldn’t be a meaningful distinction between Able and Disabled as you put it, and I largely concur with the social model of disability. However in a political and social context where some people with disabilities feel disadvantaged, these issues do warrant scrutiny. If some people are choosing to self-identify as ‘Disabled People Against The Cuts’, for example, I don’t think it is my place to tell them that they shouldn’t identify themselves in that way, or that their struggle is unworthy of attention. Or doesn't an enlightened society respect any self-identification or group formation, and protect the rights of that group...for example if there is evidence of systematic discrimination, or abuse of power? The blog calls for political representation to be more representative of the people it represents, which gets my vote. Not quite sure why this issue has warranted a blog. I had always thought that, in an enlightened society, there is not Able or Disabled - there is only Working or Not Working. This needs to be left where it belongs and not dignified by a response from the RSA.